This site is designed to be a resource of computing alternatives. I try to cover operating systems that are not usually covered by your local IT/IS person (who most likely doesn't know that any other operating system other than Windows exist). I try to cover as much of the basics as I can, and information is always being added. 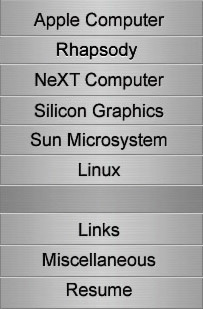 The goal is for any of the platforms covered to be used as an acceptable primary computer system (that is you have a word processor, internet browser, image editor, PDA connection, and a few games as a base line usable systems). Because this site is in a constant state of construction, some areas may not get updated that often, while other are added to regularly. I'll try to spread the wealth, and get to all the areas as regularly as possible. UPDATE (7/2005): I've greatly expanded and improved (I hope) the NeXT section. I am hoping that the new format of that section will be easier to maintain. Also I've added donation buttons to the home pages of each of the major sections. I needed to upgrade the sites resources (with my host) to handle the increased traffic it has been getting and the amount of space it takes up on the server (the site is about twice the size it was yesterday). Another addition is a Google SiteSearch field on the major home pages. I noticed that Google does a good job of scanning my site regularly, so hopefully this tool will make finding information on the site that much easier.